2Department of Oral Implantology, Faculty of Dentistry, Istanbul University, Istanbul, Turkey. Aim: Anterior single tooth replacement with immediate implants has become a predictable and well-established treatment modality in the modern implant practice. The restoration protocol of these cases is also a challenging subject for clinicians because of esthetic demands of patients. The purpose of this case series was to document a clinical treatment protocol for immediately restored immediate implants (IRII) and report success rates and the esthetic scores of these cases. 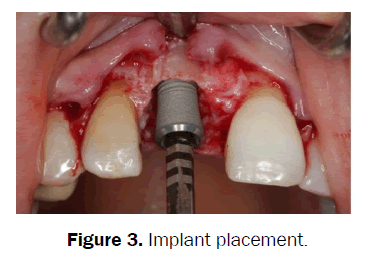 Materials and Methods: These case series were based on the information from 5 immediately restored immediate implant cases that had been treated in a private practice between 2008 and 2013. Results: There were 5 patients included in these case series mean age 31, 8 ± 11, 39. All of the implants were placed at maxillary lateral or central incisor position. Implant’s lengths were minimum 13 mm and diameters were minimum 4 mm. No implants were lost and no signs of infection were occurred. The mean follow-up time was 40, 8 ± 13, 68 months and the mean total PES, WES values were 17 ± 1, 87. Conclusion: It can be concluded that, IRII protocol may be a successful treatment modality in the implant literature. Anterior single tooth replacement with immediate implants has become a predictable and well-established treatment modality in the modern implant practice. The restoration protocol of these cases is also a challenging subject for clinicians because of esthetic demands of patients. Atraumatic root removal, placing a single implant properly and contoured provisional restoration bring success in the esthetic zone. Unsuccessful treatments of anterior maxilla implants can cause disastrous clinical situations that can only be corrected with removal of the implant and following tissue augmentation procedures. Immediately restored immediate implantation (IRII) concept was first introduces by Wohrle in 1998 and up to present it is proven to be a predictable treatment approach in implant dentistry with numerous studies [1-5]. Time consuming with traditional surgeryand loading protocol is a challenging situation for clinicians. Immediate implantation and immediate loading provides timesaving and reduces the number of surgeries; the other point is the capacity of conserving hard and soft tissues, which may be useful for white and pink esthetic . If the original papilla is preserved by the simultaneous provisional restorations, soft tissue augmentation procedures can be eradicated. Proper gingival margin at the same level with the neighbouring tooth, maintaining intact papilla and obtaining or preserving convex contour of alveol crest can be achieved by IRII protocol [1-3]. Current literature indicates that immediately restored immediate implantation (IRII) has similar success rates like delayed implantplacement and delayed loading protocol . Despite, the important detail of esthetic concerns are in frequently involved in the assessment of the articles. Pink Esthetic Score (PES), White Esthetic Score (WES) and the Implant Crown Aesthetic Index are accepted as objective evaluative indexes for implant treatments [4,6-11]. 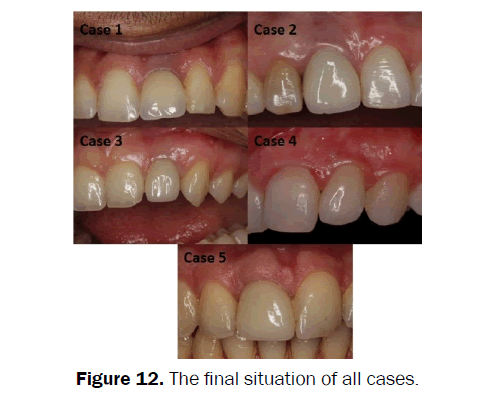 The purpose of this case series was to document a clinical treatment protocol for IRII and report success rates and the esthetic scores of these cases. Patient Selection: This case series was based on the information from 5 cases that had been treated with an IRII in a private practice between 2008 and 2013. All implants were required to have insertion torque values above 35 N cm. 1. At least 18 years old. 3. Presence of a single failing tooth because of endodontic reason in the anterior esthetic zone without acute infection. 5. Presence of available bone volume assessed by panoramic radiographs to provide primary stability. 5. Loss of buccal bone after extraction of the failing tooth. Clinical Procedures: Following the administration of local anesthetic (Articain + Epineprine), the failing tooth was removed atraumatically by the help of periotomes (Figure 1). 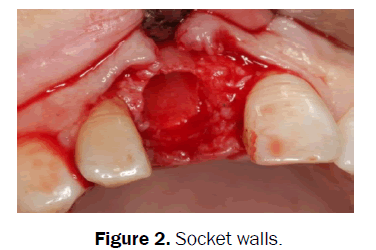 Extraction socket was than examined with a periodontal probe, if the socket walls were intact (Figure 2). Platform switched and internal double hex design (Astra Tech Osseospeed TX implants, Dentsply Implants, Molndal, Sweden) were selected and implant surgery was performed by obeying the surgical rules of implant company (Figure 3). Figure 1. 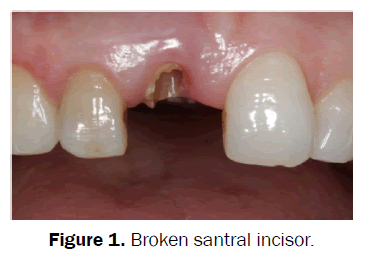 Broken santral incisor. The adjacent teeth served as a reference point and “comfort” and “danger” zones as described by Buser et al. were considered for placing the implants in an ideal position [12,13]. Dimensions of the implants were selected based on the planned restoration and the amount of available bone below the apex of the extraction socket. Mesiodistally, implants placed minimum 1, 5 mm above from the adjacent tooth to allow proper papillae formation. Orofacially, implants placed 1, 5 mm palatal from the imaginary line highlighted from the adjacent teeth's most facial point (Figure 4). The apicocoronal positioning of the implant shoulder was located 2 mm apical to the midfacial gingival margin of the planned restoration or apical to the line between the zenith points of adjacent teeth. Peridontal probes were usedfor levelingthe cementoenamel junction of adjacent teeth. If the buccal bone was not intact or the gap between the implant shoulder and buccal bone was higher than 2 mm, bone graft substitutes (Bio-Oss, Geistlich, Switzerland) have been applied. Figure 4. Implant placement in the comfort zones. ant placement. Primary stability of implants was confirmed for immediate provisionalization procedure. Mesial and distal papillas were then sutured with silk suture material (Dogsan, Istanbul, Turkey). Temporary abutment (Temp Design, Astra Tech Dental, Molndal, Sweden) was placed onto the implant. The centric occlusion and the shape of gingival tissues were controlled (Figure 5). Abutment was then prepared extraorally and hand tightened onto the implant. A little hole was prepared on the palatinal side of a plastic strip crown for implant screw driver to build up a screw-retained provisional crown. Strip crown with an autopolymerizing acrylic resin inside was applied to the temporary abutment in chair side for preparing a provisional restoration (Figure 6). Screw driver was inserted inside the hole to prevent leakage of the acrylic material inside. When polymerization completed, the provisional crown screwed off and the residual acrylic materials were removed and polished. The hole was closed after screwing the implant crown, with composite material and the occlusal contacts were removed (Figure 7). Figure 5. Immediate provisional abutment. Figure 6. 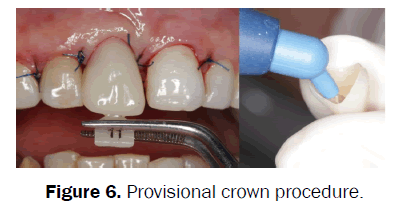 Provisional crown procedure. Figure 7. Screw retained provisional crown. Apropriate antibiotic (Amoxicillin + Clavulanic acid) and analgesic (Naproksen 275) were prescribed. Patients were advised not to brush the surgical site, but rather to rinsewith chlorhexidine glukonat (Benzidamin HCL + Chlorhexidine Glukonat). Also, patients were advised against functioning or activities that involved the operation site. The sutures were removed 7 days later. Patients were controlled per month until the final impression taken. In control sessions, emergence profile and papilla formation were observed and if necessary, temporary crown was modified by adding new acrylic material in order to create a proper emergence profile. After healing of 4 months, temporary restoration was unscrewed and a custom made impression coping was fabricated by the use of standard impression coping and flowable composite material (Filtek Supreme Ultra Flowable Restorative, 3M Espe, Minnesota, USA). Standard impression coping was screwed to the implant and flowable composite was immediately applied around the impression coping to imitate the shape of gingival tissues and papilla around the temporary crown. After polymerization of the composite a custom-made impression coping was obtained (Figure 8). The final implant impression was made using high viscosity vinyl polysiloxane (3M Espe Imprint 3 Monophase Impression Material, 3 M Espe Dental Products, Minnesota, USA). 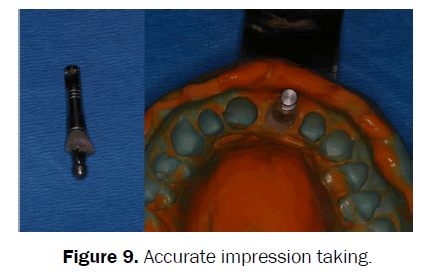 After the impression, impression coping was unscrewed and the sharp parts of the composite material was corrected and polished and the impression coping was screwed with the implant replica (Figure 9). The cast was obtained with an accurate transfer of the emergence profile of the implant crown (Figure 10). Figure 8. Impression taking of soft tissue contours. Figure 9. Accurate impression taking. The emergence profile of the zirconium abutment was chosen by the help of this cast and was proved in-situ. 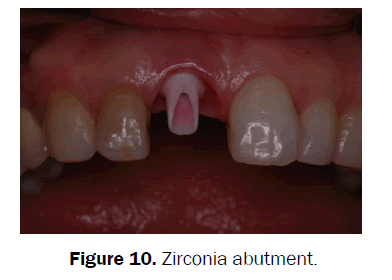 The finished abutment was torque to 35 N cm and the definitive zirconia restoration was cemented (Figure 11). Clinical Follow-up Examination: All of the patients were recalled in 2013 for implant assessment. At follow-up appointments, patients underwent periodontal probing for periodontal assessment. Photographs were taken of 5 single tooth implants in the esthetic zone of maxilla (Canon, Canon MR14 EX Macro ring lite flash, Canon EF 100 mm F/2, 8 L Macro, Tokyo, Japan). For evaluating anterior tooth replacements, the reference tooth had to be visible well enough to ensure comparability. Figure 11. 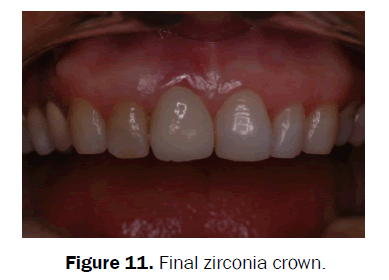 Final zirconia crown. All esthetic assessments were made by the same observer (EM). The PES was used to evaluate the esthetic result of periimplant soft tissues and the WES was used to figure out the esthetic outcome of the implant restoration. Each parameter was evaluated with a 0-1-2 score with 2 being the best and 0 being the worst score. Papillas were assessed for completeness; the other parameters were assessed by comparison with a reference tooth, which is the contra-lateral tooth for incisors. PES and WES were recorded as described by Furhauser and Belser was recorded [9,10]. There were 5 patients (Figure 12) included in this case series with amean age of 31, 8 ± 11, 39. Patient’s gender, implant’ sites, lengths, diameters, total PES, WES values and follow-up times were given at Table 1. All of the implants were placed at maxillary lateral or central incisor position. Implant’s lengths were minimum 13 mm and diameters were minimum 4 mm. The mean follow-up time was 40, 8 ± 13, 68 months and the mean total PES and WES values were 17 ± 1, 87 (Table 1). Figure 12. The final situation of all cases. Table 1. Characteristics of patients and total scores of esthetic indexes. Soft tissue assessments were given at Table 2 below. In general, patients completed a good oral hygiene during the study. At follow-up appointment modified plaque index were mostly 0 in score, bleeding on probing measurements were mostly negative and sulcus depths were not higher than 3 mm (Table 2). Table 2. Soft tissue evaluation for all cases. Detailed esthetic parameters at follow-up examination appointments were described in Table 3 and Table 4. PES values of all patients were generally 9, the highest WES value was 10 the lowest was 8. The mean total PES value was 8, 8 ± 0, 44 and the mean total WES value was 8, 2 ± 1, 48 (Tables 3 and 4). Table 3. Detailed PES of All included implants. Table 4. Detailed WES of All included implants. At the end of the mean follow-up time of 40, 8 ± 13, 68 months, the esthetic results of this retrospective case series with 5 patients showed favorable clinical outcome for IRII protocol. The mean total PES was found 8, 8 ± 0, 44 and the mean total WES was 8, 2 ± 1, 48. The main point of this study was to evaluate the long-term stability of the esthetic outcome using IRII treatment protocol. In the present report the total outcomes were highly acceptable with a mean total score of 17 ± 1, 87 for total PES/WES values. The esthetic results were assessed with a PES index and a WES index. The PES index evaluates soft tissue esthetics and the WES index evaluates the implant crown esthetic and mostly used in the literature for esthetic evaluation [10-15]. The PES index evaluates soft tissue esthetics including the height of the papillas, the buccal mucosa and the root convexity. The WES evaluates the crown esthetic including the tooth form, volume and color. These parameters are highly challenging and vital one by one in the esthetic zone of maxilla. If papillas are incomplete, level of soft tissue margins or tooth form and color have major discrepancies, PES/WES assessment will be lower. So these cases in the anterior zone will be accepted as unsuccessful even if a great ossointegration is completed. In the present case series, both PES and WES values and PES/WES assessments were highly satisfied for an esthetic outcome. Buser, et al. were reported 1 year and 3 year results of 20 early placed single implants with contour augmentation in the esthetic zone was found both 16, 75 of mean total PES/WES values [13,14]. Another case series study by Belser, et al. was found 14, 7 of mean total PES/WES from 45 patients of early placed in the maxillary anterior. The mean total PES/WES of the present case series were slightly higher than Buser and Belser’s results which can be accepted as satisfying esthetic outcome [10,13,14]. Paul and Held 17 evaluated the clinical performance of 31 single tooth implants using the concept of IRII over a follow-up period of 1, 5 years. The mean PES were 8, 39 and the mean WES were 9, 50 in the last recall with a mean follow-up 3,4 years. All implants were osseointegrated and no peri-implant infection was observed. The total PES-WES scores were similar to our results [16,17,1]. Cosyn et al. and De Rouck et al. were reported 1 year and 3 year results of immediate single tooth implants in the anterior maxilla PES scores under 7 parameters as original. At the end of the study, PES scores were 10, 48. The mean WES scores were 8, 17 at the end of the third year. They mentioned that esthetics could be preserved by the immediate implantation. Our total WES was 8, 21 as similar to Cosyn’s 11 result. Cosyn et al. were evaluated the soft tissue preservation and pink esthetic around IRI implants. 22 implants were placed after tooth extraction and non occlusal provisional restorations were applied. After 3 months, connective tissue grafts were performed for advanced soft tissue contouring. Patients were followed 12 months. PES scores were under 7 parameters as original. After 12 months, the mean PES score were 12, 15 and the mean WES was 8, 63. They concluded that pink esthetic can be preserved by immediate implant treatment and provisional restoration. But one third of the patients were needed connective tissue graft . The IRII approach offers a treatment modality that requires only one surgical appointment and highly satisfactory preservation of hard and soft tissues. Although osseointegration of immediately placed implants and survivals were reported in high results [1,7,19-21]. The risk of vestibule soft tissue recession was a major disadvantage for the immediate placement of implants in the esthetic zone . However it is also seen in the delayed placement of implants. The main cause of the gingival recession was reported as malpositioning of the implants [12,22]. It has been proposed that position of the implant shoulder margin should be at the ideal point of emergence respecting the comfort zones in 3 dimensions results in an implant shoulder located in an ideal position, allowing for an esthetic implant restoration with stable, long term peri-implant tissue support. In the present study all implants were placed in comfort zone in all dimensions . Within the limitations of this study, it has been observed that immediately restored immediate implant protocol has many advantages. Cases showed nearly excellent esthetics both in hard and soft tissue. The nature of bone remodeling in the extraction sockets was inclined to place around the dental implant by placing implant immediately. The papillas can be preserved and soft tissues could have chance to improve around the immediate restorations. In conclusion, IRII protocol may be a successful treatment modality. WohrlePS. Single-tooth replacement in the aesthetic zone with immediate provisionalization: fourteen consecutive case reports. Pract Periodontics Aesthet Dent. 1998;10:1107-1114. Chung S, et al. Immediate single tooth replacement with subepithelial connective tissue graft using platform switching implants: A case series. J Oral Implantol 2011;37:559-569. De Rouck T, et al. Single-tooth replacement in the anterior maxilla by means of immediate implantation and provisionalization: review. Int J Oral MaxillofacImplants 2008;23:897-904. CoesynRF, et al. Immediate and conventional single implant treatment in the anterior maxilla:1 year results of a case series on hard and soft tissue response and aesthetics. J ClinPeriodontol 2011;38:385-394. Tsuda H, et al. Peri-implant tissue response following connective tissue and bone grafting in conjunction with immediate single-tooth replacement in the esthetic zone:a case series. Int J Oral Maxillofac Implants. 2011;26:427-436. Hall JA, et al. Immediately restored, single-tapered implants in the anterior maxilla:prosthodontic and aesthetic outcomes after 1 year. Clin Implant Dent Relat Res. 2007;9:34-45. KanJY, et al. Immediate placement and provisionalization of maxillary anterior single implants: 1 year prospective study. Int J Oral Maxillofac Implants. 2003;18:31-39. Meijer HJA, et al. A new index for rating aesthetics of implant-supported single crowns and adjacent soft tissue implant crown index. Clin Oral Imp Res. 2005;16:645-649. Furhauser R, et al. Evaluation of soft tissue around single-tooth implant crowns:the pink esthetic score. Clin Oral Impl Res. 2005;16:639-644. BelserUC, et al. Outcome evaluation of early placed maxillary anterior single-tooth implants using objective esthetic criteria: a cross-sectional, retrospective study in 45 patients with a 2 to 4 year follow-up using pink and white esthetic scores.J Periodontol. 2009; 80:140-151. Cosyn J, et al. Immediate single tooth implants in the anterior maxilla: 3 year results of a case series on hard and soft tissue response and aesthetics. J ClinPeriodontol. 2011; 38:746-753. Buser D, et al. Optimizing esthetics for implant restorations in the anterior maxilla: anatomic and surgical. Int J Oral Maxillofac Implants. 2003;19:43-61. Buser D, et al. Stability of contour augmentation and esthetic outcomes of implant-supported single crowns in the esthetic zone: 3 year results of a prospective study with early implant placement postextraction. J Periodontol. 2011; 82:342-349. Cosyn J, et al. Soft tissue preservation and pink aesthetics around single immediate Clin Imp Den Rel Res. 2012; 29. Paul Sand Held U. Immediate supracrestal implant placement with immediate temporization in the anterior dentition: a retrospective study of 31 implants in 26 patients with up to 5.5 years follow-up.Clin Oral Impl Res. 2013;24:710-717. KanJY, et al. Effects of the facial osseous defect morphology on gingival Dynamics after immediate tooth replacement:1 year results. J Oral Maxillofac Surg. 2007;65:13-19. De Rouck T, et al. Immediate single-tooth implants in the anterior maxilla: a 1 year case cohort stufy on hard and soft tissue response. J ClinPeriodontol. 2008;35:649-57. RosenquistB andGrentheB. Immediate placement of implants into extraction sockets:implant survival. Int J Oral Maxillofac Implants. 1996;11:205-209. Schwartz- Arad D and Chaushu G. Placement of implants into fresh extraction sites: 4 to 7 years retrospective evaluation of 95 immediate implants. J Periodontol. 1997;68:1110-1116. Polizzi G, et al. Immediate and delayed implant placement into extraction sockets: 5 year report. Clin Implant Dent Relat Res. 2000;2:93-99. EvansCDJ and Chen ST. Esthetic outcomes of immediate implant placements.Clin Oral Impl Res. 2008;19:73-80.